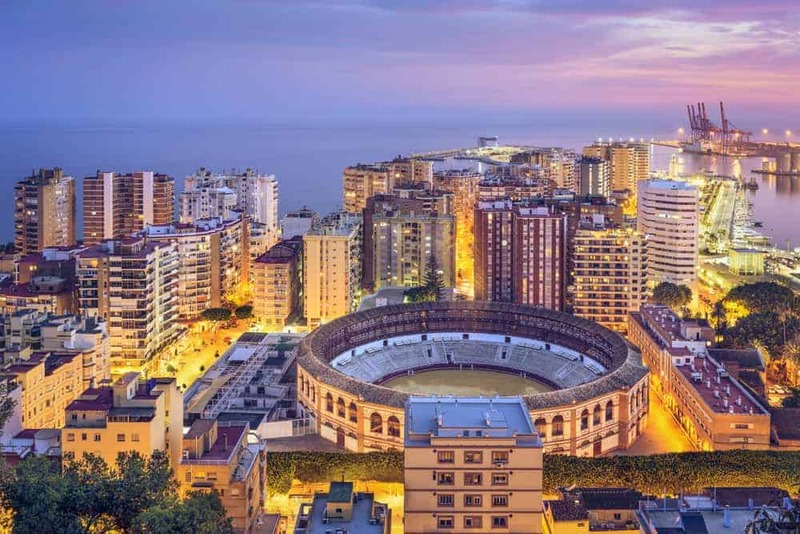 If you just fly into the airport at Malaga and go onto its more ritzy neighbours like Marbella and Puerto Banus, you are missing the delightful city of Malaga itself. The Costa del Sol with kids is fabulous – you really can’t go wrong with the sun and sand formula for a family vacation. 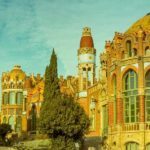 When you tire of these most famous of the Costa del Sol attractions at the hotels and mansions in Spain, head back into the city of Malaga for some great food and culture. 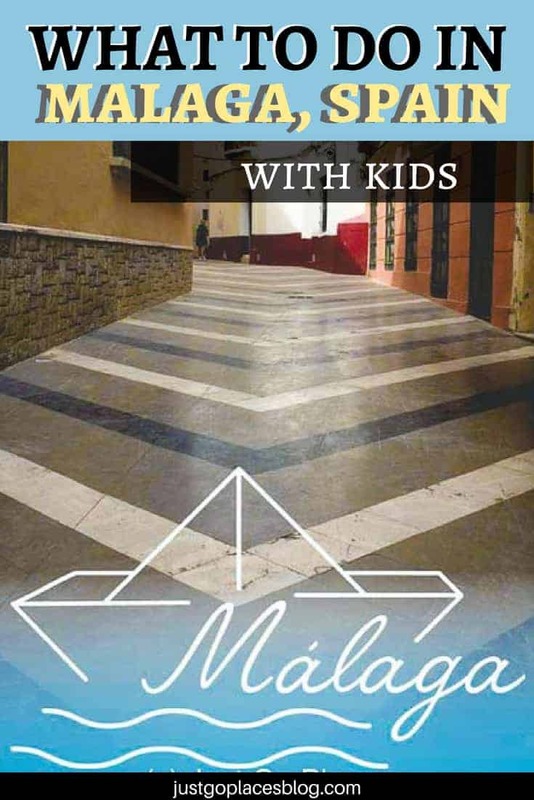 Malaga’s attractions are family-friendly, too. 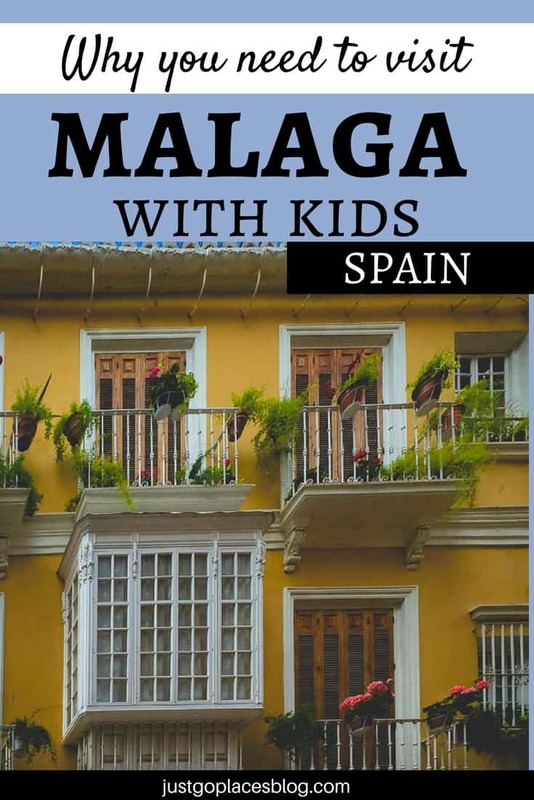 There are plenty of things to do in Malaga with kids, especially older children. 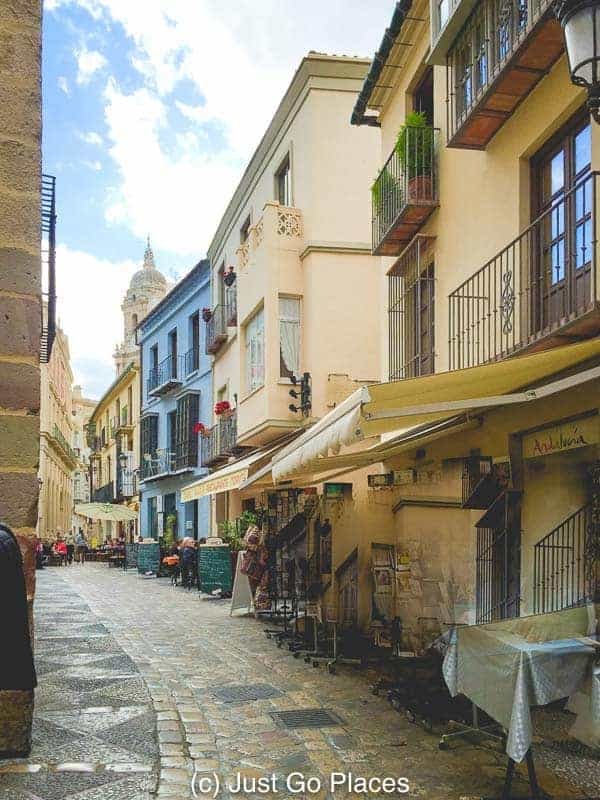 Malaga’s family-friendly attractions include lots of historic buildings and charming side streets full of shops and cafes. 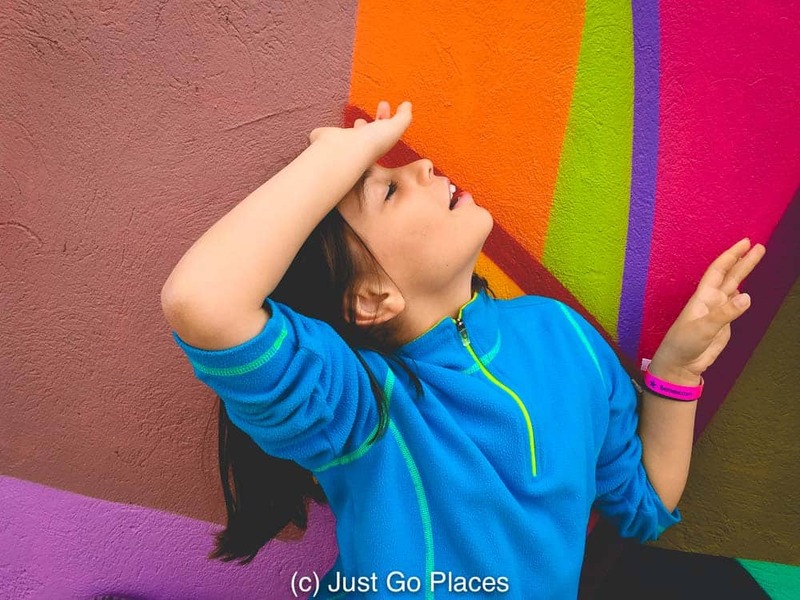 There are also quite a few free things to do in Malaga that children will enjoy such as sampling their way through food markets and checking out the fabulous street art. In terms of culture you have a choice of famous structures dating back to the Romans and the Moors as well as a handful of good museums. The majority of the remains of the Gibralfaro Castle are its impressive ramparts which kids will love exploring. It was built in the 10th century by the caliph of Cordoba. Fun Facts – The Siege of Malaga was the first battle where both sides used gunpowder in battle. Also, this siege was the first time special vehicles to transport victims (i.e., ambulances) were used. The Alcazaba is an 11th century Moorish palace and fortress built on the ruins of a Roman predecessor. It’s the best preserved Moorish fortress in Spain. Another plus point? Once you’ve climbed up to the Gibralfaro you’ll have a terrific view over the city. The view of Malaga from the hilltop above. The Roman Theatre was built in the 3rd century and is located pretty much at the bottom of the Alcazaba fortress. The theatre was built by the Romans under Emperor Augustus in the first century B.C.. After the Romans left, the Moors repurposed some of the stones from the theatre for the Alcazaba. Malaga Cathedral was built over the Mosque that stood in its place when Ferdinand and Isabella conquered Malaga. It’s an impressive structure but was never completed because the project kept running out of money – even though the construction was ongoing over 250+ years! The Pompidou Centre in Malaga is set in the city’s harbor and the colorful cuboid glass building itself is entrancing. It is the only branch of the Pompidou outside of Paris. It’s got works from the 20th century such as old favourites like Frida Kahlo, Matisse and Rene Magritte. Set in an old mansion, the Picasso Museum showcases the works of the Malaga-born artist. The museum has works by Picasso donated by his daughter-in-law and grandson. After a redesign in 2017, the museum is arranged in chronological order and houses more than 150+ of Picasso’s works. There’s a great rooftop restaurant at the Picasso Museum which is a local hotspot in its own right. The Picasso Museum is the most visited museum in Andalusia! Remember not to mix it up with Casa Natal which is Picasso’s actual birthplace and has only a small exhibition dedicated to him. 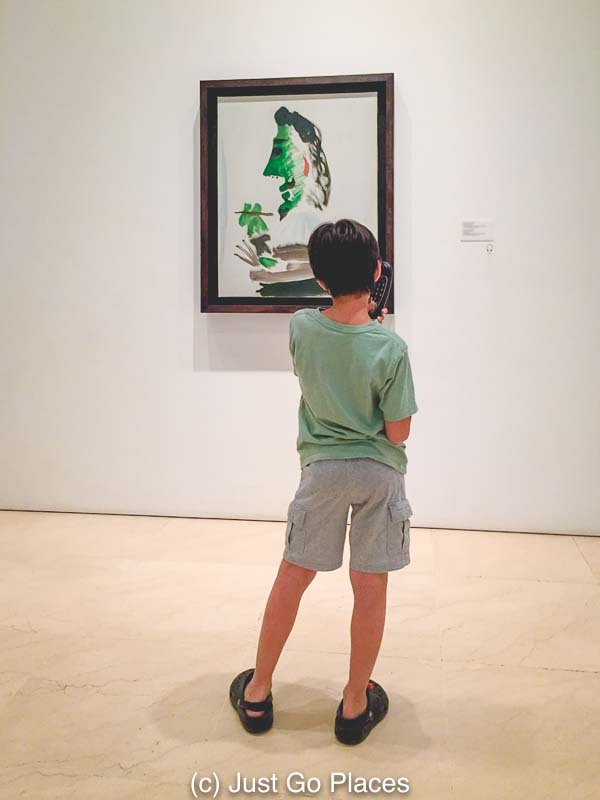 At the Picasso Museum, my son is caught deep in thought. You get a handset that explains works in the museum. 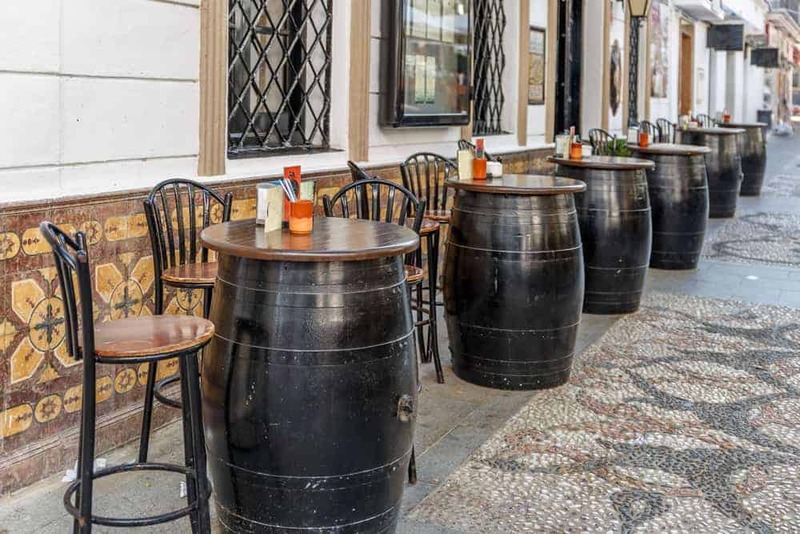 In the historic centre, you can spend hours going from tapas bar to tapas bar. We visited quite a few tapas bars, mostly nameless. We did go to El Pimpi one of the more famous tapas bars in the historic district which was frequented by many celebrities, including the Picasso family (surprise!). 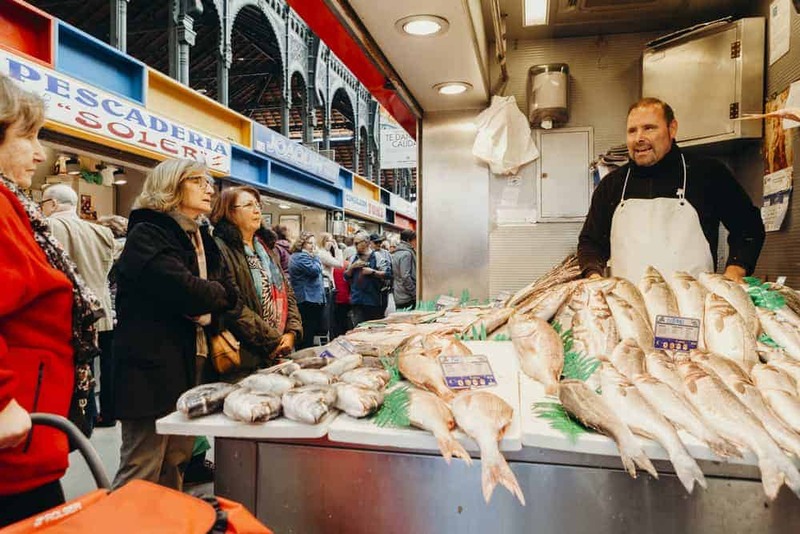 Located near the house where Picasso was born, the Mercado Merced located in the Plaza del Merced is a revitalised foodie market where you can find any number of delicious dishes to wile away a lazy lunch. Hang out in the sunshine with tapas and wine. 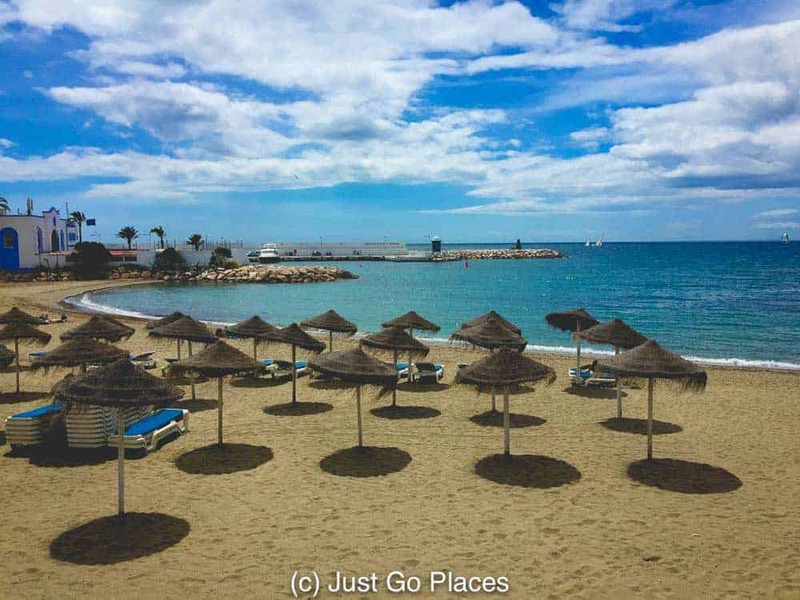 The Costa del Sol has over 150 kilometres of coastline so chances are you will find the perfect beach for you. The Costa del Sol is known for its beautiful beaches and Malaga’s beaches are no exception. Malaga has two blue flag beaches which is the highest rating for excellence you can get in Spain. 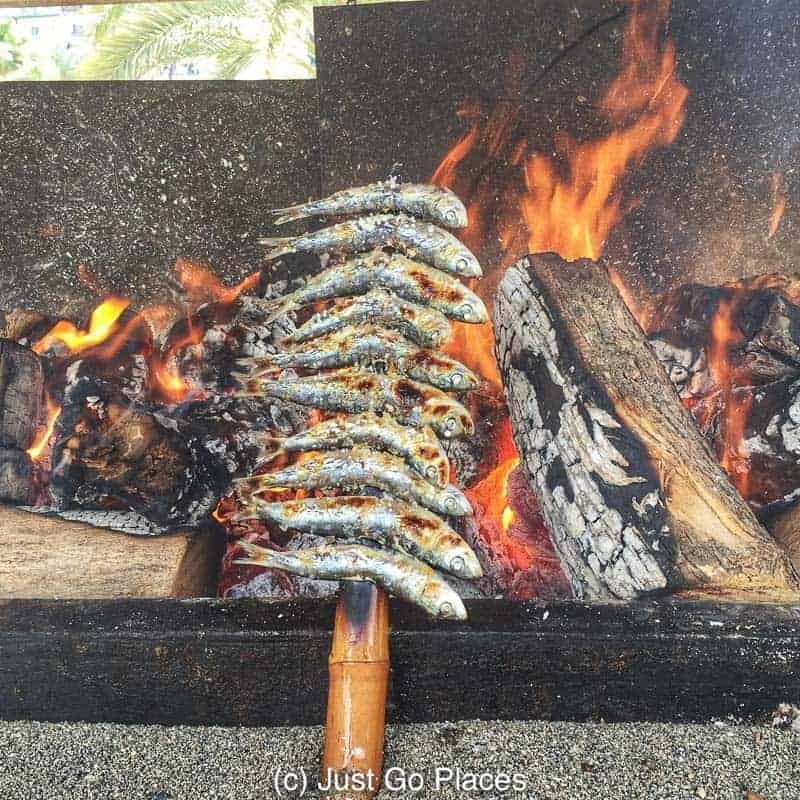 One of the fun things to do in Malaga is eat the freshly grilled sardines on the beach. The historic centre of Malaga is easy to walk and fun to explore. It’s got stores, cafes, bars galore. It’s not all tourist shops either. I found my all-time favourite camera strap at a camera store in this are and have never been able to find something similar elsewhere. If you go away from the tourist crowds, the back streets of Malaga are charming and crowd-free. 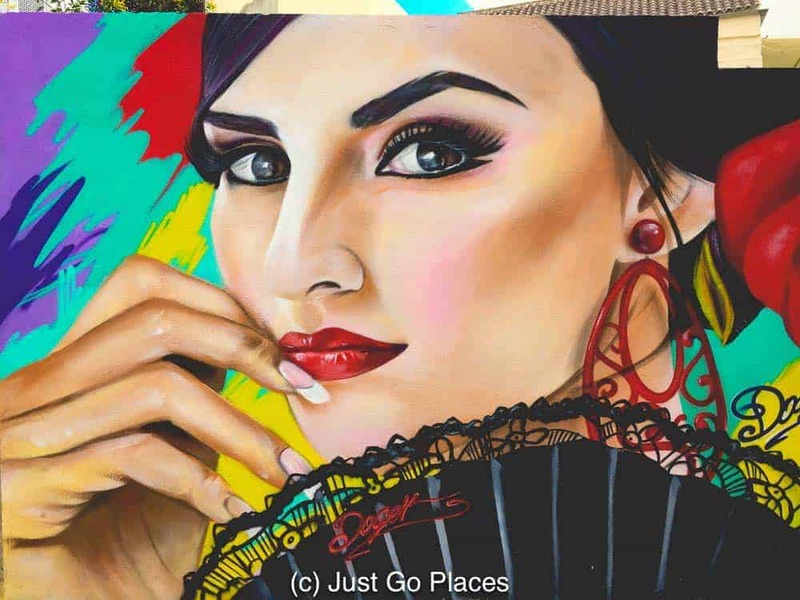 Malaga has a thriving street art scene because of the efforts of a local artistic initiative called MAUS (Malaga Arte Scene SoHo). This local initiative reminds me of the home-grown efforts in Houston to revitalise an urban area with street art. A large variety of Malaga’s street art can be found in the up-and-coming arts neighbourhood behind the Center for Contemporary Art. My kids love street art because it’s colorful and witty. And, you don’t have to visit a stuffy art gallery. Beautiful woman captured as street art. But why are her hands so much darker than her face?? My daughter can’t resist playing to the camera. 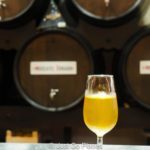 Built in a former shipyard close to Malaga harbor in 1879, Atarazanas Market is a chef’s delight. Like other food markets we have visited, my son loved checking out the market and my daughter was aghast at the smell of fresh fish and meat. 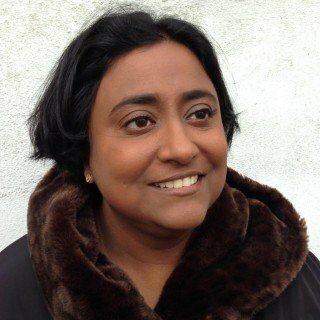 Set in a former warehouse that was the Wholesalers’ Market, the the Centre of Contemporary Art has a fun collection of 20th and 21st artists. It’s a great museum including kid-favourite Damien Hirst and pop artist Roy Lichtenstein. And, it’s totally free! So many families come to the Costa del Sol every year that there are some great theme parks located near Malaga. 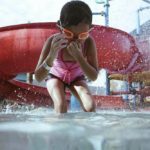 My kids have never met a waterpark that they did not like and Aqualand Torremolinos would not prove to be the exception. On a hot sunny day, racing friends on waterslides is one of the best of childhood pleasures. Tivoli World is an amusement park which has rides that are suitable for younger kids as well as older kids. You can buy ride tickets individually (which quickly adds up and drives me crazy) or an mostly-all-you-can ride pass. Note that there are popular rides that the kids will want to ride (such as bumper cars) that aren’t in the all-you-can-ride pass. 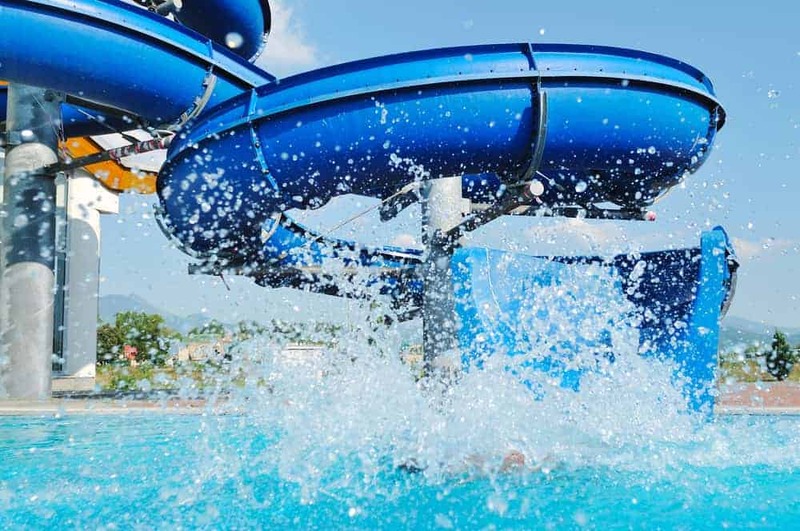 Nothing beats water park fun on a hot day if you are a kid. Malaga is a very easy destination to visit from the United Kingdom and many parts of Europe because of its airport. The airport is modern and easy to navigate. I know – I did it 3x in one day because I had to pick up different people from the airport! 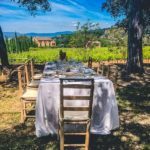 In terms of accommodation, you have a choice of hotels, villas and mansions in Spain as you would expect from such a popular tourist area. We have rented both villas as well as stayed in hotels in Spain. Our kids definitely prefer villa holidays with friends because they have the freedom of a house and pool.